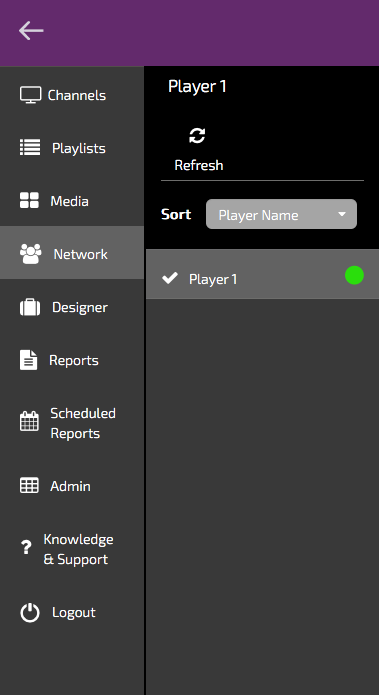 You can instantly view the status of your player network using the network health monitoring page. Click Network in the menu and then click the Network Health tab to instantly see the status of your network. 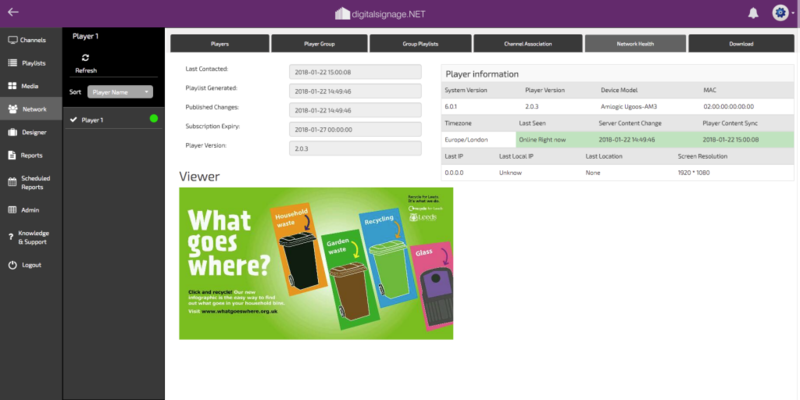 The system uses a simple red (offline) and green (online) indicator to show you if the player is connected to the cloud server and is this is updated every 15 minutes. Please note:If the player shows as offline this could be due to internet outage or the player process isn’t running. Please check your internet connection and that the application is running on the media player. If you click on a player in the list the additional information is also provided to the right, such as player software version, last contacted time and Subscription expiry. Last Contacted: The time when the player last made contact with the cloud server. Playlist Generated: The time when a playlist was last created which would have affected the playback, such as adding a new piece of content to a playlist the player was already displaying. Publish Changes: The time when a Publish Changes was last performed that would have affected the player. This can be useful to check if a change to a playlist was actually sent to a player. Subscription Expiry: The date and time when the subscription for the player will end. After this date/time the player will stop playback and the screen will go blank. Player Version: The version of the player software installed on the playback device. The viewer show a real-time feed direct from the media player. This real-time view consists of snapshots of the player playback and relays what is playing on the media player back into the Network Health section.